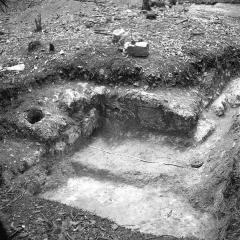 Results 31 - 45 of 124 for "structure"
Caption: Structure 6E-144, southern face of southwest corner of inner pyramid. 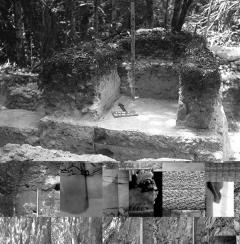 Credit: Dennis Puleston, University of Pennsylvania Tikal Project Negative 64-37-76, University of Pennsylvania Museum. All rights reserved. 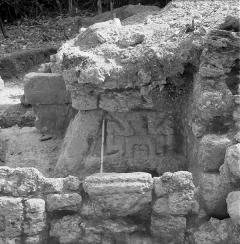 Caption: Structure 6E-144, north face of southeast corner. 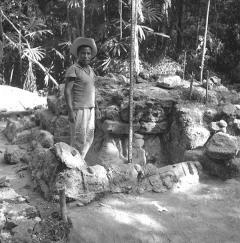 Credit: Dennis Puleston, University of Pennsylvania Tikal Project Negative 64-37-187, University of Pennsylvania Museum. All rights reserved. 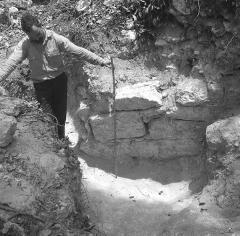 Caption: East Survey Strip, Test Area II, Blimp Structure (Str. 5F-49), view from west side, 1966.
Credit: Bennet Bronson, University of Pennsylvania Tikal Project Negative 66-84-1, All rights reserved. University of Pennsylvania Museum. 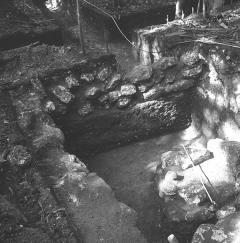 Caption: East Survey Strip, Test Area II, Bongo Group, South (excavated) part of Bishop Structure (Str. 5F-48), 1966.
Credit: Bennet Bronson, University of Pennsylvania Tikal Project Negative 66-84-7, All rights reserved. University of Pennsylvania Museum. 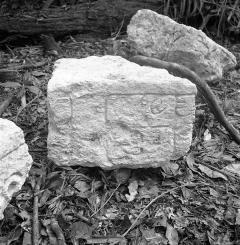 Caption: North Survey Strip, Test Area IV, Structure 3D-126, cleared area inside walls, from southwest, 1966.
Credit: Bennet Bronson, University of Pennsylvania Tikal Project Negative 66-84-142, All rights reserved. University of Pennsylvania Museum. 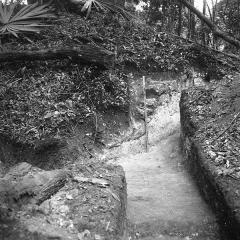 Caption: Navajuelal Structure SE(S)-423, axial trench, looking north-northeast, Bench 3 on right, Spring 1967.
Credit: Ernestene Green, University of Pennsylvania Tikal Project Negative 67-97-4, All rights reserved. University of Pennsylvania Museum. 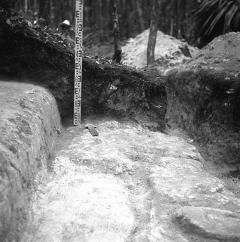 Caption: Navajuelal Structure SE(S)-423, west extension of axial trench, looking north, Spring 1967.
Credit: Ernestene Green, University of Pennsylvania Tikal Project Negative 67-97-44, All rights reserved. University of Pennsylvania Museum. 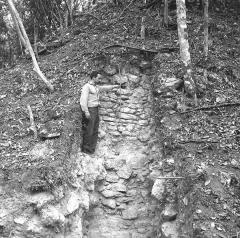 Caption: Navajuelal Structure SE(S)-433, looking west along north wall on east side of structure, Summer 1967.
Credit: Ernestene Green, University of Pennsylvania Tikal Project Negative 67-97-142, All rights reserved. University of Pennsylvania Museum. 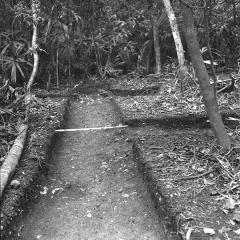 Caption: Navajuelal Structure SE(S)-433, looking north across Steps A and A', Step A built over and extending to east Step A', Summer 1967.
Credit: Ernestene Green, University of Pennsylvania Tikal Project Negative 67-97-157, All rights reserved. University of Pennsylvania Museum. 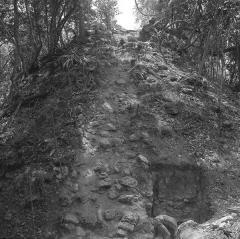 Caption: Uolantun Structure SE-482, axial trench up stairs of temple, view from tree on south side of structur; face of lowest terrace exposed to right of stairway, Spring 1967.
Credit: Michael Witter, University of Pennsylvania Tikal Project Negative 67-98-7, All rights reserved. University of Pennsylvania Museum. Caption: Uolantun Structure SE-482, view of set back rounded corner at southwest corner of temple, view from south, Spring 1967.
Credit: Michael Witter, University of Pennsylvania Tikal Project Negative 67-98-9, All rights reserved. University of Pennsylvania Museum. 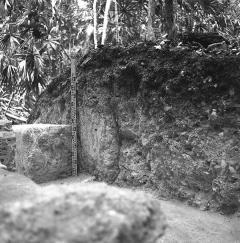 Caption: Uolantun Structure SE-482, northward view of upper terrace on south side of temple (meter stick indicates terrace), Spring 1967.
Credit: Michael Witter, University of Pennsylvania Tikal Project Negative 67-98-11, All rights reserved. University of Pennsylvania Museum. 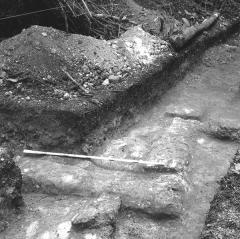 Caption: Structure SE(S)-213, view looking southeast at northwest corner and adjacent steps. 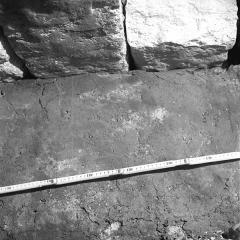 Hard packed fill underlying the structure is shown in center of photo, May 1967.
Credit: Michael Witter, University of Pennsylvania Tikal Project Negative 67-98-17, All rights reserved. University of Pennsylvania Museum. 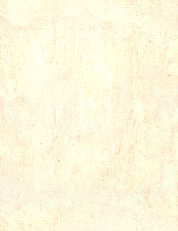 Caption: Uolantun, Structure SE-482, Burial 209, view of paint on the wall of the tomb, July 1967.
Credit: Dennis Puleston, University of Pennsylvania Tikal Project Negative 67-37-31, All rights reserved. University of Pennsylvania Museum.